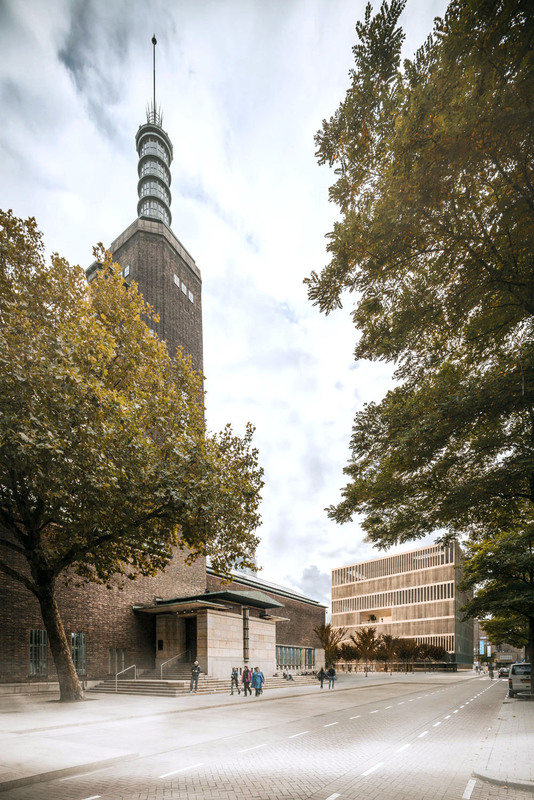 The collection building for Museum Boijmans Van Beuningen is a building with secure storage conditions, (restoration)ateliers and other staff rooms mixed with public functions such as exhibition spaces and a cafe and restaurant. A building which is anonymous and closed yet public and accessible at the same time. The collection building redefines the traditional art depot with an emphasis on the public experience and a view onto ‘working with art’. The collection building and the Museumpark, in which the building is situated, reinforce each other. The building is as compact as possible and its position the result of careful consideration. The ground floor is completely transparent and the building is connected to the existing museum via a paved public square with trees. This new public square forms a defined entrance to the Museumpark. Building, architecture, functions and interior are attuned in the collection building on the basis of a strong design concept. The building is recognisable, modest and no-nonsense: sculptural with a distinctive presence and a clear entrance. Large incisions at the different floor levels form ‘elevated sculpture gardens’ and allow daylight deep into the building. The internal transparency enables views onto the non-public activities in the building and blends the public and art depot functions.